If you are one of the seasoned Magento store administrators, then by this time you must have learnt that Magento can be complex software. Still, if you wish to effectively upgrade your Magento website from any versions to the latest version without hampering the data, I must inform you that although it is possible but it needs a lot of effort and practical knowledge. Magento is an enormous eCommerce platform for building shopping cart. The Magento community and its developers keep upgrading new version of Magento in the eCommerce market with the new structured development. It is natural that every online merchant wants to upgrade Magento’s latest version to efficiently run their business. In this context, nearly after five years later, Magento released its latest version of Magento 2.0. With this latest version, the performance of Magento is expected to increase by at least 20% than its previous version. There are a host of different methods to upgrade Magento. However, before that, the practice of proper backups is mandatory. What do you think is important for backups of a Magento store? Is it the files which contain your product images, themes and extensions? Or is it the database, where all your customer’s orders, data and product information are stored? Well, for an online merchant both are important. Before, I tell you how to successfully upgrade your Magento store; I must share the precautions you should take before upgrading a Magento application: Take a quick look at it. Before upgrading the new version of Magento, you should be thoroughly equipped with the new features and modifications made in the application. As you know the measures to protect your data, you are ready to upgrade Magento. Therefore, let me help you with some of the core techniques. You can call this a Magento to Magento import. There are extensions available to allow you to transfer all your database items across another version of Magento. So how do you benefit from this? It allows you to retain a fresh installation of Magento and port across the essential themes and extensions and then migrate your data. Upgrade ‘Mage _All_Latest’. This will upgrade Magento. Magento’s huge file system contains abundant upgrade scripts. These upgrade scripts are responsible for programmatically updating your database for every single module that makes up Magento. Whenever a new version of Magento is released, the scripts increase in size especially whenever any modification of the database is required. Login through secure shell by using puTTY, an SSH client. Connect to your server’s hostname or to the IP or domain name and login using your hosting control panel username and password. As soon as you access your site via SSH, back up Magento. Install a latest version of Magento on your development domain first. These include all the new database and files. Simply run the browser-based installer. As soon as the new Magento website starts functioning, start porting across all the old files that you want to keep. The local.XML should be removed to make Magento aware of the new installation. Simply delete and rename local.XML as app/etc/local.XML in the development domain. Create a new database on the server and import the previous database dump from the old website. One of the easiest way to import or export database is through SSH (Secure Shell). Once the database is imported refresh the development domain homepage. This is done to trigger the installation scripts. The new files contain MySQL upgrade scripts for all the key functionality of Magento. Here you will find that through the installation process Magento picks up all that you have connected to the older database. After upgrading Magento, you should opt for quality testing for the upgraded Magento version. It is done to ensure the systematic functioning of Magento. However, you can use quality testing tools as released by Magento to ensure proper working of your web application. The greatest advantage of using such tools is to increase the stability of your online web store. 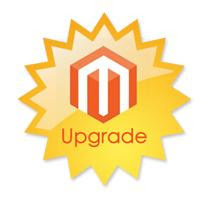 Magento 3rd party extension upgrades to deliver best upgrade services without losing vital information and data.